Pot-bellied pigs can grow to be 100 pounds to 250 pounds and live for 12 to 15 years. 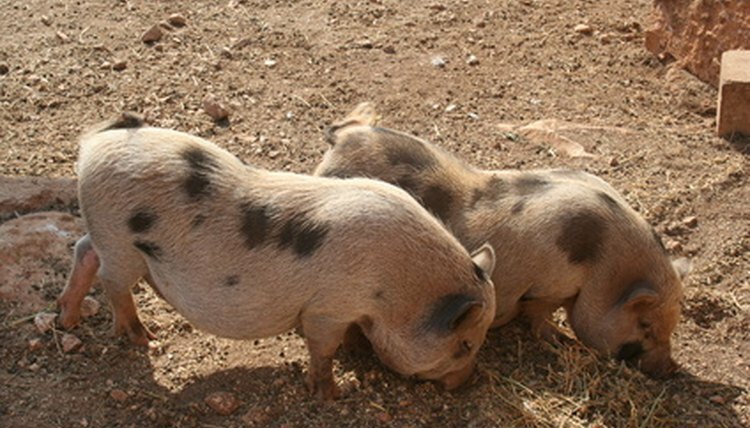 Pot-bellied pigs and their miniature cousins are highly social and are kept as pets in many households, with training similar to that used for dogs. The structure of of a pot-bellied pig's face, though, leads to some problems. These pigs have small, folded eyes, which can become infected or irritated. When there is a problem, take some immediate steps. Monitor your pot-bellied pig closely. These pigs get folds over their eyes as they age, and have naturally runny eyes, but any excessive tearing or crustiness may be a sign of a more serious problem. If your pig has excessively crusty eyes, use a warm cloth to soak its eyes and clean them out. Sometimes a good cleaning clears up the problem. Take the pig to your vet if the problem doesn't clear within a couple of days. Any true infection requires antibiotics, which are only available through vets. Pot-bellied pigs also suffer from entropia, where their eyelashes turn and grow into their eyes. This condition requires surgery. Your vet will diagnose whether your pig has an infection or entropia, and make the appropriate prescription. Follow the antibiotic schedule given to you by the vet, if the problem is truly an infection. Feed the pot-bellied pig its antibiotics until the prescription is finished. Begin supplementing your pig's food with Vitamin E solution, which helps to clear and prevent eye infections.